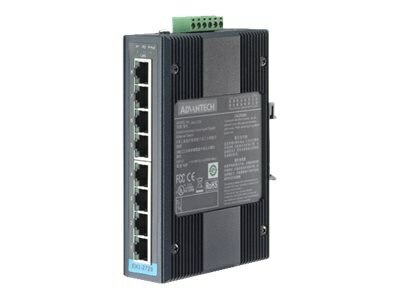 The EKI-2728 supports Gigabit Ethernet. The power is a +12 - 48 VDC redundant input design, and is secured with a double protection mechanism: power polarity reverse protect and an overload current reset able fuse. The former tolerates reverse power wiring while the later secures the system from overload currents. As the power supply turns normal, EKI-2728 will automatically get back to normal operation state. Each port of EKI-2728 has 2 LED's to show the link status transmission speed and collision status. It also provides a relay output for an event alarm. In the event of a power failure, the built-in LED will activate the alarm to notify administrators. Engineers can simply verify the hardware status by checking the LED, and have troubleshooting easy and quick. EKI-2728 comes with compact metal housing that rates IP30 to help against from dusty industrial environments.